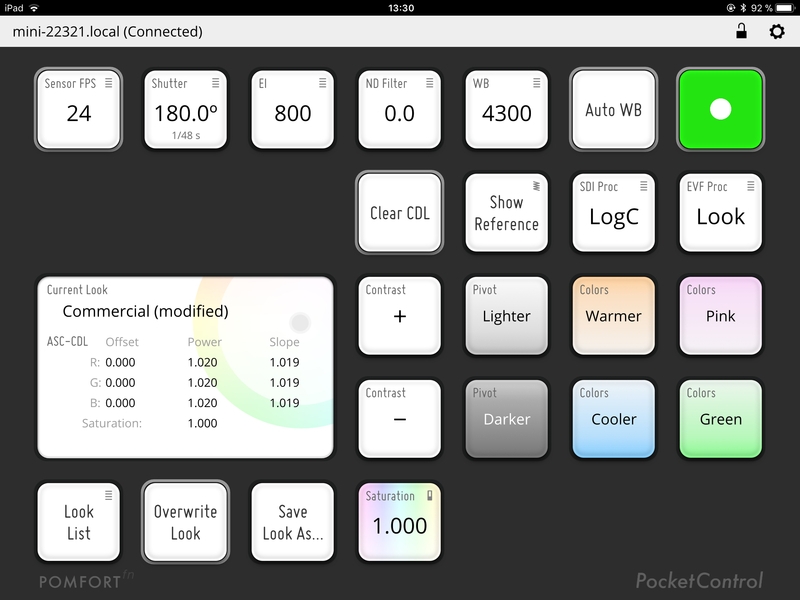 PocketControl is an iOS based application for iPad or iPhone that allows to control the camera settings of ARRI cameras remotely. 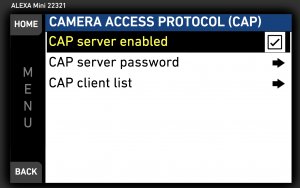 In order to control the camera, the app uses ARRI’s camera access protocol (CAP). With the camera software update SUP 5.1, access to various camera settings via the CAP was enabled. 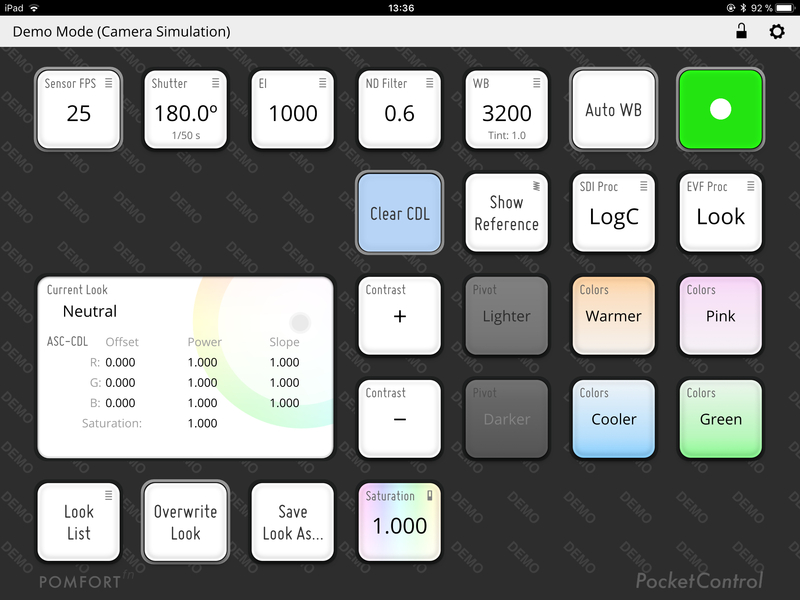 Therefore, in order to use PocketControl, first make sure to have SUP 5.1 or later installed on the camera. In the next step you will then have to connect the app to the camera. 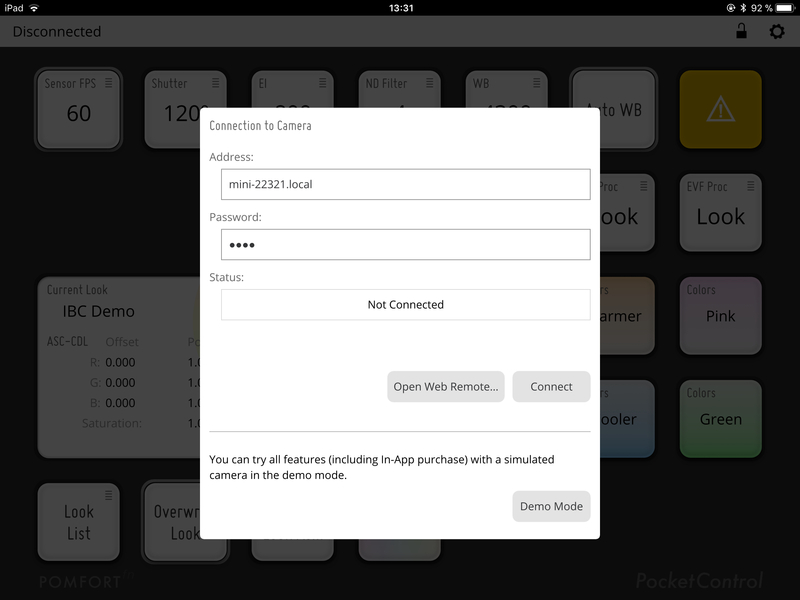 In the following we will give you detailed explanation on how to connect PocketControl to the camera. Enable WiFi in the Alexa Mini. Go to MENU > System > Network / WiFi > WiFi power. 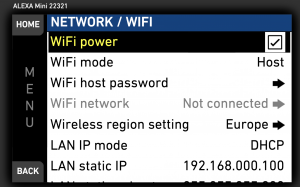 Depending on your setup you might further need to configure the WiFi settings (WiFi mode, WiFi host password etc.). Make sure the CAP protocol is enabled in the Alexa Mini. Go to MENU > System > Camera access protocol (CAP). The default password is “arri”. We strongly recommend to set a custom password. 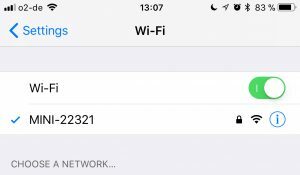 Connect your iPad/iPhone to the WiFi of the camera through the iOS settings. Enter the host name of the camera into the “Address” field of the camera connection dialog. The host name of the camera has the format mini-xxxxx.local (replace xxxxx with your camera’s 5-digit serial number) and the password you set in the Alexa Mini’s CAP menu. Hit the connect button to connect to the camera. The connection status gives you feedback on the establishing of the connection. Please see the section “Troubleshooting“ below if you should not be able to connect to the camera. Hit a button to open its setting. Buttons with a border access more critical settings (e.g record, sensor FPS, clear CDL, etc.). To avoid an accidental change these buttons have to be pressed long to gain access to alter their value. To disconnect from the camera hit the “Connected” button in the upper left corner to reach the connection dialog. There you can disconnect from the camera. When no camera is at hand the integrated PocketControl demo mode helps you to get a better understanding of the application. In the connection dialog just click the “Demo Mode” button to connect to a demo camera. You can now use the app as if you were connected to a real camera. The warning sign on yellow ground at the position of the recording button in the demo mode indicates that it obviously cannot be recorded. When connected to a camera the same icon indicates that it cannot be recorded due to trouble with the recording medium (e.g. no card inserted or card full). If you are not able to connect to the camera in most of the cases it is either a network connection problem or related to the CAP. 1. Try if the iPad/iPhone can reach the Alexa Mini’s / Amira’s web remote. To do so enter the URL http://mini-xxxxx.local into the Safari browser. 2. If you can access the Alexa Mini’s / Amira’s web remote, the iPad has a network connection to the camera. In that case please check your CAP settings are enabled. If it’s not working, check your network setup.